This week I’ve shot down two titles from my newest “Rule of sevens” target list. One “oldie but goldie”, the other… meh. As the list consists of titles I was (and am) really looking forward to playing, I hope it has no more “rotten eggs” like that. As always, time will tell. A team-based hack and slash RPG with active pause. Quite recently I've tried to play - and failed - the first instance of the series. The reason I've dropped it was not dated visuals (though it definitely offers nothing to write home about from today's perspective), but extremely clunky and user-unfriendly controls and interface in general. The sequel rectified that issue, which let other game elements shine - and shine they did, as Dungeon Siege 2 was a really enjoyable experience for me. Detailed character progression system (including "raising stats by using them" mechanics I'm a complete sucker for), a lot of equipment to choose from, diverse environments to visit, dungeons, crypts and other underground areas to plunder, a ton of secret areas opened by hidden buttons and levers to find. The one thing the game does not deliver is story, as it is as bland and cliche as possible. Combat and party development systems do make up for that though. So, even after 13 years after release, I recommend this game - just make sure to set launch options so that it boots in Full HD and be ready for a really enjoyable time. Turn based tactics game set in Warhammer 40k universe. Personally I know next to nothing about Warhammer 40000, and I had no contact with the original Space Hulk either. I've just played the title as any other tactics game - and promptly dropped it a couple of hours later. The gameplay is slow. Extremely, painfully slow. And I mean both movement animations (walking anywhere takes ages, though we are leading a group of Ultramarines - or members of other Chapters - after all, which are human tanks in a nutshell, so it's kind of understandable), and actual combat strategy the game forces on the player. The number of enemies encountered is always superior, and letting them into melee range more often than not ends with troop loses - as there is no actual health bar for party members, one successful hit means death. We have to play very cautiously to avoid mistakes - move troops just a few steps per turn to leave enough action points for overwatch (in this state the character can shoot at enemy if it is spotted during their turn). This takes ages and is extremely repetitive and boring. Maps we explore (at least as far as I've managed to get) consist of series of very poorly lit metal corridors, which means that all missions look the same. Moreover, there is no plot whatsoever (just a short briefing - planet this-and-that was attacked by genestealers, deal with them) - so there was absolutely nothing the game had to offer for me. Some people may like it and really have fun with it, I didn't. At all. Roguelike with card based combat. As a monster slayer wannabe we try to impress the brass of the local guild, in order to gain membership. To achieve that, we delve into some monster-infested areas, killing whatever does not manage to run fast enough and gathering whatever is not nailed down. Combat is turn based, with attacks and skills represented by cards, that can be gained, removed from deck or upgraded during some events in dungeon. As a roguelike, it implements permadeath, though after our character gets killed (or manages to complete a dungeon) we gain fame, that can be used to buy some bonuses for further characters. Interesting and entertaining title, though it can get repetitive after a while, so shorter sessions are recommended. The game title alone is more or less enough to know what the title is about - another instance of the long LEGO series, inspired by The Avengers and The Avengers: Age of Ultron Movies. The title is pretty average - neither particularly bad, nor exceptionally good. One thing worth mentioning is that cutscenes are fully voiced, rather than in the usual pantomime style. Nothing special, unless someone really likes LEGO series and/or the Avengers universe. If I was to compare this title to something, it would be XCOM series mixed with Master of Orion in retro-style graphics. As a leader of fairly small group of human Federation military, occupying an ancient space station, we fight an invasion of zerg-like aliens. We need to gather resources by building mines on and around planets within our borders, research and build new space ships and facilities on the station, maintain diplomatic relations with neighbouring nations, train officers and fight enemy fleets. Combat takes place on separate screen and resembles 16bit jRPGs. Officers gain experience, that allows them to gain new abilities that can be used in battle, pilot better ships (if built on the station) and perform various tasks (including leading research progress) faster. For an indie game the title is well polished and entertaining. Moreover, while retro graphics is, to put it mildly, not my favourite, I really like the art style used here. At last some devs realised, that they can offer retro visuals without making the font and GUI in general pixelated and unreadable. Definitely worth playing. Status: I've marked the game as completed despite earning only a bit over a half of achievements - why? Those that are left either belong to a DLC I don't have, reflect some alternate diplomacy choices that do not influence the gameplay much, require playing higher difficulty levels or represent counters for actions not performed in typical (or at least my) playthrough and would have to be specifically farmed. I couldn't care less about any of them. The game is finished, all sidequests done, I've seen everything that can be seen - that marks the game complete in my book. S.T.A.L.K.E.R is a FPS with RPG elements (quest and equipment systems, no character development). Visually nothing to write home about now - though there are a couple of graphics enhancement mods - but the game offers one of the most immersive worlds I had an opportunity to visit: a dangerous place that only the fittest survive, where you can both get rich fast, finding some rare artefacts, and die due to radiation, aggressive fauna or enemy bullet. A tiny little gem - cute mixture of Samorost-type point and click game and HOPA, with captivating visuals and relaxing gameplay. It's really short, but worth looking into nonetheless. A really enjoyable open world 3rd person action game. It starts a bit slowly, when the character has no weapons or skills to speak of, but after gaining both we get a really entertaining kaleidoscope of explosions, brawler battles and general beating of bad (or rather - worse, as the protagonist is not a knight in shining armor either) guys. Marked as completed - the only thing left are racing elements I was never exactly fond of. Every marker on the whole map cleared though. Slasher/shooter in Warhammer 40k universe. As an Ultramarine , Captain Titus, we land on a planet invaded by orcs, and tasked with retrieving a weapon (a giant mech), before greenskins lay their hands on it. Chaos marines and demons soon join the fun, making a fairly easy op a bit more complicated - though nothing that a gun or two and chainsaw axe are not capable of solving. I've finished the single player mode (a short campaign with basic, but fairly interesting plot), played a match or two online, just to see what the game has to offer there and called it a day. An odd exploration/survival game. As a scientist infected with an unknown disease (causing fevers and general weakness) we arrive at an island, rumoured to contain flora that can be used to develop a cure. Gameplay consists of exploring the island, finding new plant and mushroom types, examining them for substances with medical properties, and creating some drugs from it and ultimately said cure. During the exploration we find remnants of a tribe that used to inhabit the island, as well as previous scientific expedition. Notes we find contain information about past events as well as hints regarding locations of potentially useful plants. The island is inhabited by an aggressive animal resembling a panther with horns, the character needs to either hide or run away from (a torch can also be used to scare it away). There is no GPS or auto-updating map in-game. In order to find current location and draw the map, we need to triangulate using a compass and local landmarks (which is quite simple, if a bit tedious to do). In progress: Mad Max (will take a while, as the title compels me to check each and every mark on map, and clean it completely) and Exist Archive on Vita (man, how addictively grindy this game is - I’m like 15h into the game and I feel I’ve barely scratched the surface - can easily imagine it taking 50h+ HLTB has listed). 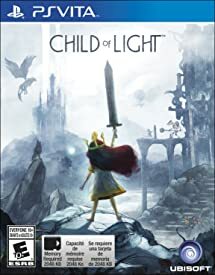 A cute 3D platformer with logic puzzles presenting a story of a young girl Hope, fighting against the evil Cancer trying to take over her town. As the description may suggest, the title is meant to help children fight cancer - both as entertainment and distraction, as well as means of fundraising (all earnings from the game are donated to Game Changer Charity organisation). The game itself is really entertaining (if short and a bit on a simplistic side), though not exactly easy gameplay-wise. I had some problems with boss battles - I admit, I'm pants at skill-based games, but still - it may be a bit too hard and frustrating for young children. Still, a piece of good work and worthy cause. I'm not certain, how to classify this game - visual novel is the closest, I think. The title obviously refers to the author of "Nineteen Eighty-Four" novel. Here, the player takes the role of Big Brother - invigilating potential terrorists by reading information available on the internet - social media and blog entries, as well as private conversations or even data on hacked PCs and phones. Mobile jRPG published by Square Enix, ported to PS Vita. Five pairs of people are kidnapped and find themselves in unknown location called Ark. They are forced to fight not only aggressive fauna roaming around, but also each other. The winner is promised the gift of immortality, losing means death. During the course of the game background histories of each pair are revealed, as well as the purpose of the Ark and the tournament. 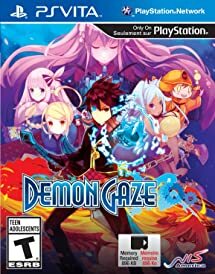 The title offers turn-based combat and mechanics typical for jRPGs, as well as a bit simple, but entertaining and captivating plot. In order to see the true ending, the title needs to be finished 4 times (once for each pair) - the final boss unlocks at that stage. Unfortunately, even if the title is fully translated into English, it is available for Asian region only - it can be bought directly from PSN if one owns Japanese account, or played from a physical copy of Chaos Rings 3 - Prequel Trilogy - though the first three instances of the series still need to be downloaded from PSN using Asian account. Contrary to my Steam statistics, I've finished the game - on my PS Vita. As it is the same game, just with some controls adjustment, I mark the PC version completed as well. The title is your usual, run-the-mill retro jRPG, with simplistic plot (as a prince of a kingdom terrorized by a powerful dragon, our task is to gather legendary weapons and allies and slay the beast), standard progression and inventory system. The only distinguishing feature is job system, similar - if more simple - to the one used in Final Fantasy V.
May be worth checking out if you get the title in bundle, but I wouldn't buy it for full price. Status: completed - main quest, all subquests and all optional areas finished. This game is just bad - lack of balance and thought put into actual player experience makes the gameplay completely pointless. We start as medieval trader, with one cart and some pocket change. Our task is to earn a fortune by buying goods cheap in one city and sell them with interest in another. There are two problems though: costs of travel are extremely high, and there is no way of determining prices of a particular good in other cities without visiting them (as they are random), the game offers no information regarding price range either - so we have no idea what is worth buying in particular place and where to take those goods to sell them. The game offers some quests (of a fedex nature) - and that's it, so even if one manages to wrap their head around the title's economy, the boredom and repetitiveness will soon follow. By many people considered a great game, but it is really dated now. I've tried playing, but decided not to carry on after an hour. I don't mind the visuals, they're acceptable, especially considering release date, what deterred me were extremely clunky controls - I was just unable to set the camera right and selecting characters was far from intuitive; next to unusable map and lack of direction, as well as dull combat - but that issue may become less pronounced at higher levels. Contrary to some negative reviews on Steam, I had no problems with launching the title in FullHD (following a guide to set launch options) and had no technical issues afterwards. Still - unless someone really wishes to delve in the past, I would suggest refraining from playing the title now - it did not age well. I wonder if the other two instances of the series I have in my backlog as well meet the same fate. Time will tell. A dated (released in 2007) hack&slash. One of the games I can only ask myself "why did I actually complete that?" about. The problem does not even lie in visuals (while definitely nothing breathtaking, the title at least launches in 1080p), but in a really clunky controls (mostly combat and item use). Somebody had a bright idea to create a combo-like spell casting system: in order to cast a spell - and you do it all the time, the character is a mage after all - you need to press (for example): up, down, up, RMB. Unique and completely unviable. Fortunately standard key bindings can be used as well. After adding a bland and uninspiring plot, the result is a mediocre game I cannot recommend. Status: completed (unless I've missed a sidequest or two somewhere, not that I really care at this point). Dungeon crawler with turn-based battles on a separate screen and visual novel-style conversations. Interesting, long and quite difficult at times. Towards the end of the game some serious grinding was required, as I’ve observed a definite difficulty curve spike (in Astro’s domain). Fortunately there are some QOL functionalities - autowalk (choose a cell on the map and the party will move there on their own, though random battles will still occur), ability to repeat all combat orders in the following round as well as speeding up all actions during a round by holding circle button. There are some quirky characters and Japanese-style gags I’m not exactly fond of, but all in all it was a really enjoyable experience. Status: completed - all bosses (including post-game) beaten. Time spent: ~50h. Yes, VITA has its own version as well. A platformer with RPG elements and ATB-based combat on a separate screen, with distinct feel of a fairy tale: enforced with plot, visuals and characters speaking in rhymes. An unique element is a firefly that accompanies us thorough the game, who we can give orders to (using right stick or touchscreen, the latter works really well), to light dark areas, open chests, operate mechanisms, heal the party both in and out of combat, as well as blind enemies to slow them down. Even though I was a bit bored with overly long battles in the last couple of chapters and rhymed conversations weren’t easy to follow, it was still a very enjoyable and relaxing experience. Status: completed - main storyline and all sidequests finished. Time spent: ~15h. Indie action RPG with a lot of humour and references to pop-culture in general, and RPGs in particular (e.g. we meed Claude, an ex-soldier, and Iris, a florist). The title offers a quite cliche plot, really basic inventory and progression system and a bit clunky real time combat. All in all an interesting experience, but nothing really breathtaking. Might be worth picking up on some sale or bundle. Yep, Tales mania at its finest. It’s the third instance of the series I’ve played (after Symphonia and Berseria), though the first on platform other than PC. Comparing to aforementioned titles it offers more standard plot of “party against the big bad entity trying to destroy the world” - which by no means make it uninteresting, quite the contrary, it’s on par with most respected titles of the genre - it’s just I was kind of spoiled by Symphonia’s and Berseria’s dark themes and ambiguity I’ll be looking for in all other (j) RPG games (in most cases, in vain) from now on. 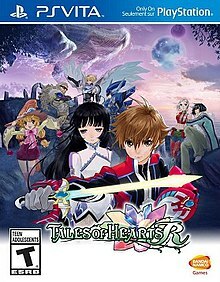 Tales of Hearts R offers typical for the series, dynamic real-time, skill and combo based combat (with freedom of movement) and fairly complex and novel character development system. After each gained level characters receive points that can be spent on one of five character traits. After specific level of each of those traits are reached, new weapon forms, abilities, spells and passive bonuses are unlocked. Moreover, fighting together lets characters develop bonds, that allow them to learn some of those bonuses from each other. Other than that, the title offers typical for the series and genre mixture of following story, exploring, questing and conversations (including large number of discussions between party members and short scenes a.k.a. skits). The title looks really good (at least on the 5” Vita screen), too - well, apart from some cutscenes, that are taken directly from NDS version and offer visibly lower quality and 5:4 aspect ratio. Still - definitely worth playing.